There is a lot to like about bands bashing it out in a reckless manner that screams "oh my god how do we drive this thing!" Indeed, a lot of being an indie rock fan is responding positively to that appeal. But it is also a distinct pleasure to hear and experience a band with such mastery of its chosen aesthetic that it can make its songs leap like circus tigers or change shape as if being marched past funhouse mirrors. 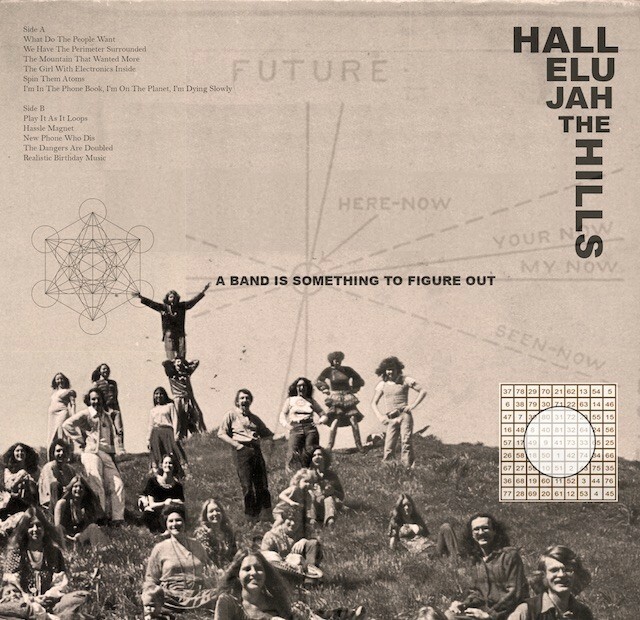 Massachusetts indie rock institution Hallelujah The Hills certainly lounges in that latter category: its new record, its fifth, is called A Band Is Something To Figure Out, but it could just as easily be called This Is What It Sounds Like When A Rock Band Has It All Figured Out. Given the band passed its 10th birthday late last year, we suppose there's a reasonable expectation Hallelujah The Hills should know what it is doing at this point. But that does not dull the dazzle and delight of the smart and agile A Band Is Something To Figure Out, which song-for-song is the band's best outing to date. Its 11 tunes cast fronter Ryan Walsh's engaging studies of the quirks of our shared reality -- the weird truths in plain sight that we can't or won't see -- within rock frameworks that reliably stretch to accommodate subversive, irreverent impulses. Mr. Walsh's literate, carnival barker vocals balloon with substance, and offer occasional winking acknowledgements at the show business of it all. The record opens with the thrumming clarion call of "What Do The People Want," whose chorus bluntly but not unkindly observes "the people don't know what they want" -- in a way, it's more reminder than indictment. The lyrics also include an internal reference to a tune from the quintet's debut long player, a move that usually earns automatic gold stars from Clicky Clicky. "People" is chased by the forthright banger "We Have The Perimeter Surrounded," which spins a yarn about Woody Guthrie relating a dream that foretold the punk movement (a tale bolstered by an apparently falsified FBI file, which apparently drew the attention of federal law enforcement; we don't want to know what parts of the story are and are not real, because it is just too good). Those numbers are prelude to the even more formidable heart of A Band Is Something To Figure Out, where Hallelujah The Hills gets down to the business of terrific guitar-pop and experimentation. Should-be mega-hit "The Mountain That Wanted More" and the even more mega "The Girl With Electronics Inside" present undeniable hooks. The latter emerges from a brief daydream of piano and launches into verses that alternately drop a line, a neat trick that plays against the song's passionate momentum. Dresden Dolls' best number, "Coin-Operated Boy" (the version from A Is For Accident, imho), once mused on life with an automaton, but Walsh's tune is decidedly more intimate -- the nominal girl is a mystery, the narrator is hopelessly smitten, and the tale feels a lot like real love. The rocker "I'm In The Phone Book, I'm On The Planet, I'm Dying Slowly" compacts mundanity, modernity and mortality into a catchphrase in a manner just as witty and striking as did On Kawara. Later, the beautiful droner "New Phone Who Dis" pushes out at the boundaries of Hallelujah The Hills' admirable songcraft, presenting a pastiche of looped found sounds, wandering piano and droning guitar, over which Walsh hauntingly delivers. Hallelujah The Hills releases A Band Is Something To Figure Out via its own Discrete Pageantry label tomorrow. The collection is already available for pre-orders in a limited edition of 500 180 gram 12" vinyl LPs via Re-Vinyl Records (never mind the obsolete album title and art), or as a CD or digital download via the band's Bandcamp wigwam. Hallelujah The Hills fêtes A Band Is Something To Figure Out with an album release show at Great Scott in Allston Rock City on Thursday May 12; the bill also includes Swale and Old Hat. Stream the aforementioned "What Do The People Want" and "We Have The Perimeter Surrounded" via the Bandcamp embed below; PopMatters is streaming the entire collection right here. Look for Hallelujah The Hills to be on the road later this year; maybe they'll even be on your road? They'll figure it out.